The holidays are always a busy time for the missionary committee. We sold soap for the "Mamas" in Burkina Faso, Africa and were able to send them $250.00. They will use this money to buy more soap-making supplies, material for their sewing projects, and even some chickens. The women are learning about God's love and how to provide for their children. The congregation filled shoe boxes for Samaritan's Purse in November. We sent 82 boxes filled with toys, school supplies and hygiene items. Also, every month we have a collection theme for food for Loaves and Fishes. This is going very well, and it is much appreciated by Loaves and Fishes. February's theme is "Show the Love!" Instead of collecting food, we arc asking for a love offering. Please put your donation into one of the of offering envelopes and mark it L&F with a heart! As a committee, it was decided that we'll no longer support KIM (Kids International Ministries). As a church, we have supported the Long family in the Philippines for many years; however, the Longs are no longer working in this ministry so we've discontinued monthly support. We are happy to introduce our new missionaries, the McMillan family. Matthew McMillan is Sarah Comstock's brother and he and his family are living in the far northern region of Russia. Matthew and his wife Shaylea and their three children, Shiloh, Tabyn and Sawyer, are serving with Pioneer Bible Translators. Please add them to your prayers for safety and strength and for them to endure the sunless days in good spirits! Other prayers needed are: Kendra Brady in Tanzania, Africa. She is having visa problems and may have to leave the country. She has become fluent in Swahili and has connected with many of the people. Janet and Don Guizzctti need prayers for safety. When they arrived in Burkina six years ago, it was a peaceful and safe country. It has become more and more dangerous with kidnappings and killing of the police and educators. Please keep Sandy Jackson and her family in your prayers too as they adjust to life without Dan. 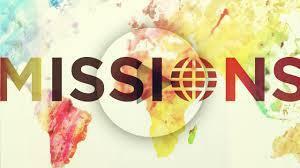 The Missions Committee meets the second Tuesday of the month at 5:30 in the library. Please feel free to join us anytime.